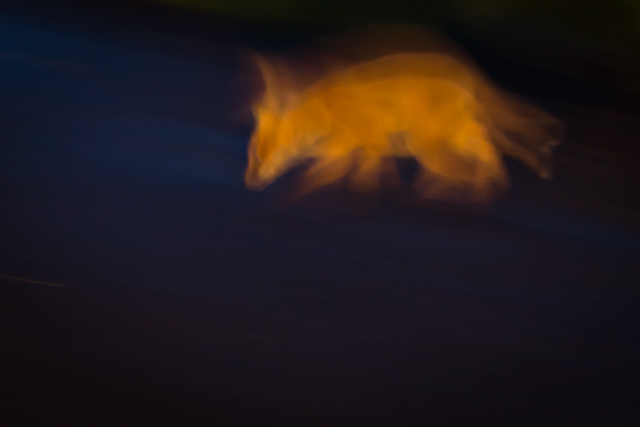 My image of a red fox cub in car headlights (above) was shortlisted in the Wildlife Photographer of the Year competition in the ‘Creative’ category, but progressed no further. Driving home one night I encountered 3 cubs gamboling about in a narrow country lane without a care in the world. They were oblivious to the sound of car engines and headlights. I hope they survived to adulthood. As any technically-fastidious wildlife photographer will tell you the term ‘creative’ is reserved for blurry, out-of-focus images, and this effort on my part made no attempt to challenge that prejudice! 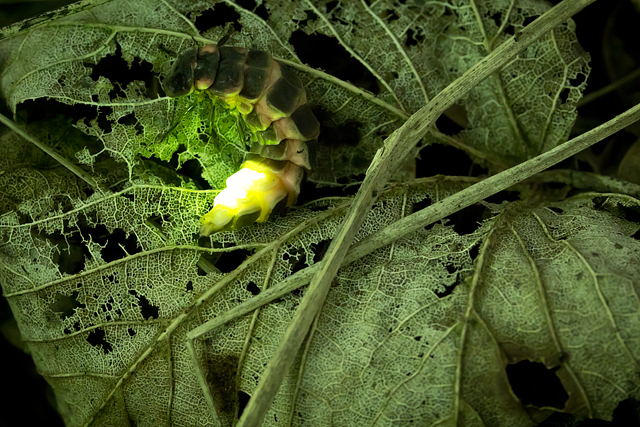 In the domestic British Wildlife Photography Awards this year my image of a glow worm displaying against leaf litter was shortlisted in the ‘Hidden Britain’ category. Photographing glow worms is quite an adventure, and a frequently frustrating one, as my earlier blog post on the subject explains. 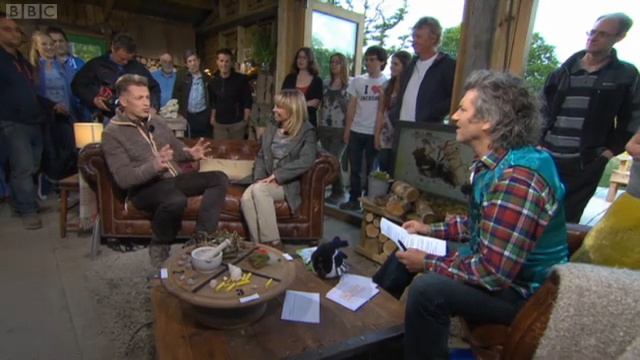 The BWPA shortlist comprises around 300 images we were informed, so the shortlist is not especially exclusive it seems! Winners have yet to be announced. 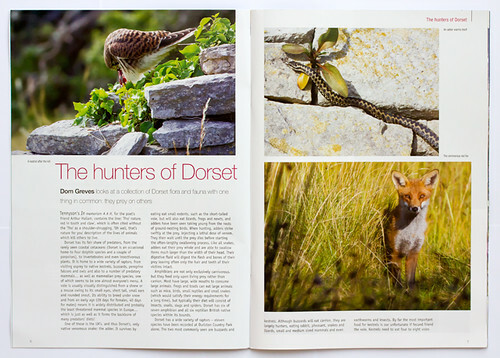 A selection of my images illustrates an article about predatory animals and plants in the May edition of Dorset Life magazine, out this month. 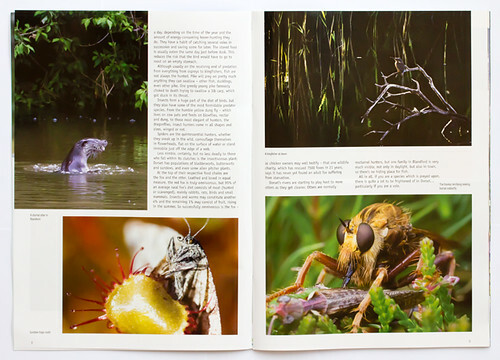 Featured flora and fauna include: the kestrel, adder, red fox, otter, sundew, kingfisher and hornet robberfly. Words by Joël Lacey. Available now at all good newsagents and supermarkets in the Dorset area! 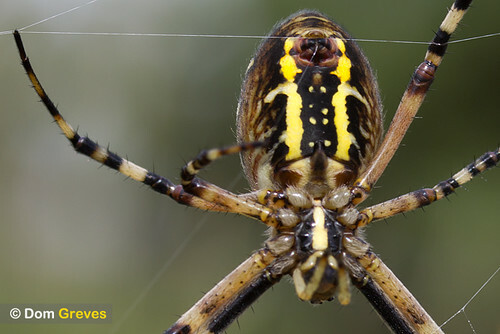 It’s not what you’d expect from a British spider – the distinctive black, white and yellow stripes give it a dramatic appearance, and at 2cm it’s fairly large – something you might imagine encountering in the tropics, shortly before it bit you and ruined your holiday! Sure enough it’s a foreign invader, more commonly found in the Mediterranean and first recorded on UK shores in 1922. Since then it’s made the south coast its home and, as conditions have warmed, has spread steadily north in recent years. The Isle of Purbeck is at the southern extreme of its range in this country so it must have been present for some while. The following summer the female spiders were present in large numbers in a meadow at Durlston Country Park outside Swanage and I photographed them a little hastily with my point-and-click at the time. I couldn’t find the spiders in the places I’d spotted them previously, but while clearing another fenceline with the National Trust we stumbled across this small colony living on the edge of Godlingston Heath on the Studland peninsula. Over a couple of visits I shot some decent footage and stills at very close range with the 60mm macro lens. The conditions were a little breezy, which makes life difficult at very shallow macro depths of field but I’m pleased with the results. 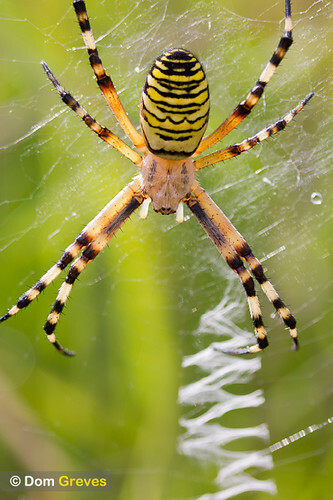 Try as I might I could not track down the male wasp spider, which is smaller and quite dull in colour. 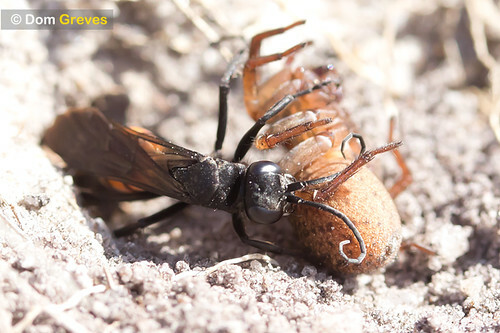 I would also have liked to include some footage of the spiders’ large egg sacs, but the weather turned wet and stormy towards the end of the month and by the time I returned the colony was washed out. Only a couple of females remained and no egg sacs.